What is your feeling on other traditions? Excuse the long post. Don't read into it, I'm not suggesting anything at all other than perhaps some superficial observations. It's just a bunch of stuff I have noticed over the years and I don't know what to make of it, really, but I'm pretty happy sticking with non-broken lineages, personally. 1. In Dzogchen we visualize the guru as all our teachers. I have asked numerous times if this means people from other traditions as well and the answer I invariably get is: "ALLLL teachers." The reason this question is important to me is because when I think of the chain events that got me here, well it probably has a lot to do with random new age stuff I read in high school, some of which are no doubt fraudulent, but nevertheless I did learn from enough to break out of old belief systems and onto the next thing. 2. In Dzogchen, we are not limited, we can do any practice. Tibetan culture itself is a mix of many things. Though I might use Tibetan Mo methods of divination, I feel like a different method is not appropriate. Similarly, we have various practices to help with our minds, bodies and relative existence. Some of these have been mixed into the Tibetan culture from Hindu or Bonpo sources or elsewhere, but we think of them as Tibetan and part of our lineage, so that seems okay. We make offerings so as not to disturb local spirits with our practice and we invite demons to feed on us in Chod. There are other traditions out there that deal with spirits and demons and have practices to help with our minds, bodies and relative existence, too. If we are not limited and see something has immediate benefit, do we rule it out because it was not part of our lineage and absorbed into Tibetan culture a long time ago? He claims to have also received transmission 34 times. He is very knowledgable. 5. I know jack squat about Native American culture, but apparently people think there is some big similarity between Hopi and Tibetan cultures and that they may share a common ancestry. 6. I saw a Kabballah book on the shelf of Tibet House. I asked Tashi about it and he said, "Yes. Very old." I asked him if they were selling it because they felt it had any similarity to Tibetan Buddhism, but he didn't seem to understand the question. Or want to answer. I vaguely remember reading about a few meetings of a rabbi and a monk or lama in which a lot of people were surprised by the amount of seeming overlap in teachings. 7. Many say the Kabballist Tree of Life and the Trikaya seem very similar and especially in relation to the Dzogchen view of self-originated primordial wisdom. Briefly, both deal with emptiness and fullness and an infinite source with unimpeded rays leading to the creation of this world. Both also say "everything is perfect" and that we are ignorant and must return to the source to gain real wisdom, which is beyond concept and limitation. 9. Tarot is a big part of occulty Kabballah (they spell it "Qabalah"), too. The guy who made The Buddha Tarot seems to think the Buddha's life story is comparable with the "journey of the fool" through the 22 major arcana. I don't think so. 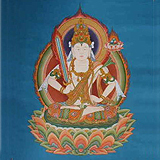 Other systems based around the Qabalah, such as Thelema, have often had members or "advanced practitioners" claim that there is a lot of overlap with Tibetan Vajrayana. There are quite a few people who are involved in both Vajrayana and Thelema or some other Qabalah-based Western Mystery Tradition, as it's called. One guy recently wrote a book called Tantric Thelema. There are some similar ideas between the two, but I don't know how to explain it adequately without making this even longer. Briefly, Nuit is the all-encompassing queen of space similar to the Mother of the Victorious Ones, Arya Tara, and her lover is Hadit, the pinpoint of personal experience and volition which could be compared to a heart-drop, for example. Here is a picture of Nuit whose breast is feeding the caduceus of the Tree of Life and chakras and central channels. You can see how she is emptiness and Mother in one. Someone else painted this, so I'm just regurgitating ideas that are out there. 10. Neal J. Pollock, who reviews a lot of Tibetan Vajryana and especially Dzogchen books over on Amazon.com is apparently part of the Rosicruician organization which our friend username on this Dharmawheel forum says is linked with very dark forces and has intention to cull the population down to some very low number (I forgot). When he first said this, the first thing I thought of was the Georgia Guidestones, but having studied with a group that used a lot of Rosicrucian material in my past (the same organization in which I studied the occulty Qabalah) and probably being a lot more familiar with it than him, I took this with a grain of salt. But it did remind me of what I remember from the new agey Rosicrucian-ish Qabalah groups that there is a spiritual war going on which involve a hierarchy of various beings just kind of planted in space and watching everything. Pretty creepy. I remember lots of discussion of people meeting with them or seeing them in visions while they were scrying on the tree of life or whatever. 11. The Rosicrucian type of groups also try to find familiarity with Hinduism and Buddhism and there does seem to be some kind of overlap with the Tree of Life, caduceus, chakras and solar, lunar and central channels. Of course, that doesn't mean anything other than perhaps the Rosicrucians pillaged ideas from other cultures and slapped them all together (which is my feeling)! Still, if they are using the same ideas and energy and whatnot, I wonder if anything similar results... or if there is a corruption which just works against you somehow. I know a lot of Dzogchen students came from Hindu yoga practicing backgrounds and they don't generally put it down as "bad," they just put it down as incomplete. 12. In the DVD with Robert Thurman and Deepak Chopra (which I streamed on Netflix out of curiosity and was one of the worst things I had ever seen), Thurman keeps saying that there is no difference between Hindu and Buddhist thought, but that it is semantic. Oh boy! 13. Then there is Kennard Lipman, the guy who spent a lifetime studying and practicing Buddhism and Dzogchen and translating who is now a rabbi enjoying the mystical tradition of the Kabballah, but still feels like it's a good idea to release new translations of Buddhist texts. How odd. I am not interested in following these other traditions. Just curious what others think. There seems to be a lot of friendly acceptance among Tibetan lamas of other ideas and it just makes me wonder if perhaps these other traditions are part of those other paths that wind slowly up the mountain. I know most people who came to Dzogchen did not come to Dzogchen first, but spent time in other organizations such as these before finally stumbling onto Dzogchen and going "wow!" The downside of this, of course, is now we have a head full of ideas from other traditions and want to compare them, just as I've done above. In your opinion does "unifying all teachers" include these sorts of new age teachers? I don't really think about it much, personally. I just abstractly unify them and I usually kind of see Namkhai Norbu's face and Lama Tsering Everest's face since they are the two I've taken refuge with. • Makes more sense to stick with one path... but, if we are not limited and can do whatever is useful for us, is there really anything wrong with all this? Other than confusing yourself and others? Finally, that took me forever to write and I did the best I could mentioning all the things that came to mind, but there is more and it is more involved than that. I can't go back and edit it for any more clarity. Essentially this is just a post about the bold parts in the top and bottom of the post, with some additional details in the middle to explain what I mean. Re: What is your feeling on other traditions? I suppose the other thing I think about is how the new agey westerners are so gung-ho to cross-reference all systems based on their Tree of Life diagram, usually. And Hindu culture likes to claim the Buddha as one of their own, an emanation of Vishnu or something. But, the same is not really true of Buddhism, is it? I haven't really heard of Tibetans saying "oh yes, angels are the equivalent of dakinis!" or "the archangels correspond with the Dhyani Buddhas!" or anything really similar. There are elemental beings like the djinn or sylphs, salamanders, undines and gnomes which have no counterpart in Buddhism, I think. Then there are the Watchers, the Enochian angels and the hierarchy of 72 demons and angels thought to reside in every man, according to Qabalist tradition. It is interesting because I'm sure there's something to these various celestial beings described in other traditions, but as far as Buddhism and Dzogchen is concerned, they have no real place (yet), I think. They haven't been subdued or converted to the dharma, so I guess they are unknowns who just fall under the categories of demons, asuras and gods. And then we have the multiple variations of astrology, etc. Last edited by padma norbu on Tue May 31, 2011 1:30 am, edited 1 time in total. padma norbu wrote: In your opinion does "unifying all teachers" include these sorts of new age teachers? What more do you need wrong? Confusion by itself is already enough. We can use "whatever" is helpful, sure. But that doesn't mean mixing stuff up, which leads to the creation of terms like Jesus Christ Dharmata that I've had the fortune to read in one of the emails I regularly receive from someone these days. Yeah, I agree. If a respected master hasn't integrated a completely different system into the lineage already, then why do it? It's a shame that it didn't take long for Dzogchen to become popular among new agers. On the other hand, they are helping spread awareness of Dzogchen to people like me who saw that it was different and completely lost interest in all other traditions (save for general curiosity). I know someone who's been a Dzogchen student longer than me and is still equally involved in a Qabalist-based tradition. She is pretty darn sure they are very well-matched. Whatever, though. padma norbu wrote: I know someone who's been a Dzogchen student longer than me and is still equally involved in a Qabalist-based tradition. She is pretty darn sure they are very well-matched. Whatever, though. Well, it doesn't mean you have to abandon everything you were doing before. It's a matter of knowing what the main point is, what leads to Buddhahood and what just to some relative benefit. I still practice Qigong and a Daoist meditation on occasion. I enjoy it and it helps my health and stuff but it's not something that will lead to enlightenment. Basically, dharma is inconceivable. Dharma could be defined as "whatever guides you from samsara to liberation." This is totally relative and dependent on time, place, culture, teacher, student. The role of the Lama is also inconceivable. They say that the greater your devotion to the Lama, the more you begin to see all your experiences as the Lama's teachings. I also have practiced quite a few different new-agey and Eastern traditions (non-Buddhist) before finding myself clicking with Tibetan Vajrayana. Sometimes I tend to look down on these other practices, as if they are not true dharma - but for me as well, these were vital parts of my path that eventually led me here. So I think it can be a very lovely and worthwhile contemplation on gratitude and interdependence to hold these teachers and paths in great respect, as they can be seen as manifestations of the Lama to the extent that they brought you to dharma. I think the question about considering "all" your past teachers, regardless of tradition, as one with the Lama is very interesting. Why not try on this attitude and see what kind of effect it has on your mind? I find at this moment this has an expansive effect for me. This is NOT the same as combining teachings from different traditions. And if at a time this view becomes confusing, better to focus on your principal teachers. Sometimes, when my mind is more relaxed and expansive, I have no problem seeing Guru Rinpoche as indistinguishable from several of my teachers, all at the same time. At other times, when my mind is feeling more closed and dualistic, I find it easier to focus on one teacher in particular. In Vajrayana in particular we have many, many tools and practices at our disposal, and part of practicing dharma effectively is knowing how to apply them to various situations - and often this requires creativity and trial and error. dakini_boi wrote: I think the question about considering "all" your past teachers, regardless of tradition, as one with the Lama is very interesting. Why not try on this attitude and see what kind of effect it has on your mind? Well, I did in the beginning because that's what people told me to do. But, it's not supposed to be an overly visual or elaborate thinking experience, anyway, so over the years it's naturally gotten more vague for me. I rarely think much of anything about the other traditions, so they naturally don't really occur to me anymore in this instant. I actually just sort of generically think of the buddha nature of all beings, I think. It's more of a feeling than a thought process. Both of those, on the outset, seem rather different to me than cross-referencing different cosmologies all the time, but that's just my feeling. If I am sweeping the floor, can I mix my dharma practice into it? Is sweeping the floor any different from any other activity? People say that if you slice an apple halfway down the middle, and open up the two halves, you see a star. Really, there is no star. We think there is a similarity because we already have the idea of "star shape" in our minds. In fact, stars do not look like this either. two traditions may point to the same conclusions but for very different reasons. Have you asked yourself what it is that you are really after? PadmaVonSamba wrote: two traditions may point to the same conclusions but for very different reasons. PadmaVonSamba wrote: Have you asked yourself what it is that you are really after? Why are you asking me this question? Ohhh, I dunno. It seems to me that this is one of those things that sometimes answers itself the more you look at the question. I'm not implying anything. When questions arise in my mind that are hard to answer i ask myself, "what is it that i really want to know? Why is this in my thoughts?" and so forth. Nah, I asked what I was interested in hearing, which was other people's opinions. I stated my opinions pretty clearly on the matter. The idea for this thread popped into my mind when I read username's ideas about Rosicrucianism. You know, there are a lot of good teachings from many traditions. For example, Buddhist traditions do not talk much about forgiveness, but this is at the top of the list in Christianity. Personally, I think forgivenss is a good practice and I tend to be a very forgiving person, but I don't feel as though I am 'mixing' Buddhism and Christianity. On the one hand, these are terms that refer to specific traditions, and on the other hand, these are merely labels that we put on choices we make as part of human behavior. On another forum, the question was posed, something like, "If what the Buddha taught, if the truths he explained had been taught by somebody else, would they still be true? Would we still call it Buddhism?" So, I think the labels we put on stuff has a lot to do with it. A similar question might be, "am I a buddhist during those moments when I am not thinking about dharma? personally, i do not think it is good to intentionally try to mix different traditions, to create a sort of "Frankendharma" out of bits and pieces. On the other hand, historically Buddhist teachings have mixed with other teachings. Some people would say that this contaminates the true teachings while others would say that it is a testament to the dharma's flexibility, and like water, to assume whatever shape it is poured into in order to benefit beings. But this might not be the same as trying to mix them merely because it appears they have something in common. That to me is relying too much on superficial appearances. btw, your avatar is cracking me up. Is that guy brushing his teeth or what? "Yah want some sweet and sour sauce with that felafel?" Do you take refuge in the dog barking outside? The bug on the wall? These aren't being worthy of refuge, like any non-dharma teacher, but are beings in need of refuge. Indeed, I just didn't want to make it seem like I'm saying you have to drop everything. PadmaVonSamba wrote: If I am sweeping the floor, can I mix my dharma practice into it? Sure you can "mix" dharma practice in sweeping the floor but you can't mix sweeping the floor into dharma practice. padma norbu wrote: btw, your avatar is cracking me up. Is that guy brushing his teeth or what? The Chinese scroll in the picture says "Fo Ming". Fo= Buddha , Ming=bright, as in brightness. So, it suggests the enlightenment of the Buddha, or Buddha's light. In these internet forums people often seem to be "foaming" at the mouth, like a rabid dog. but does not grasp the true meaning. because they just want to be right all the time. This is from an original painting called "Temple of The Foaming Monk". Pure nature, unbiased compassion for all. Sky remains untouched by clouds without accepting or rejecting. I don't mean to dismiss the question when I bring up the Aloha Amigo issue. but I'm bringing it up because it's a useful tool for marking where the earnest and good intention to understand and learn from our neighbors becomes a directionless mashup of everything exotic. More specifically, I think it's healthy to read the Upanishads and Irish folk tales and Lacanian cultural theory, whatever sharpens your knife, but in the end the question is where your refuge is. Related question: why is it that Dzogchen seems to be a magnet for these sorts of discourses? or rather: how is it that Dzogchen-y discourse gets drawn into this stuff? Jikan wrote: Related question: why is it that Dzogchen seems to be a magnet for these sorts of discourses? or rather: how is it that Dzogchen-y discourse gets drawn into this stuff? I can't speak for everyone who ever started such a discourse, but the reasons I brought up might have something to do with it.